I love to geek out on business data and the wine industry has more than enough reasons to get your geek on. Professor Emeritus Mike Veseth is one of the leading wine industry economist and always presents his work in a reasonably easy way to understand and apply. My key takeaway: Walla Walla’s success as one of the top performing wine regions in the US has been accelerated through the dynamic and synergistic interaction of wine industry people. The research categorizes them into four loose groups: the Pioneers, the Next Generation, the Foreign Legion and the Millennials. It’s a good read and not much longer than my preamble. I will admit, I’m not well versed in WA wines, but I will now start taking notice. Harvard business professor Michael Porter famously conceived of a “cluster” theory of “competitive advantage.” It isn’t one thing that makes a regional industry successful, he said, but rather it involves the dynamic interaction of a network of forces and factors that, when they come together, create an environment where all are successful. 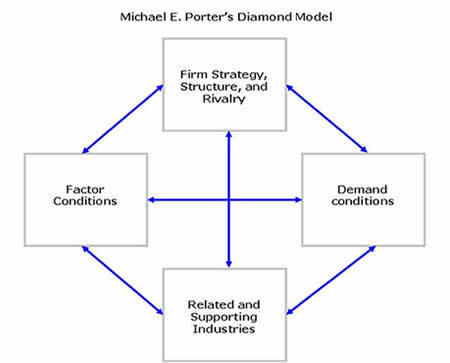 Porter’s “diamond” analysis can be applied to many regions and industries, even wine. In fact. Nick Velluzzi of the Walla Walla Community College has applied it to his region’s wine sector (click here to read about his research). If you are interested in wine clusters or Walla Walla you should check out his work.